Most racers have more performance potential in their Pontiac than they realize simply because they are not getting all their available power to the ground for maximum acceleration. Even though your drag racing Pontiac is leaving "straight" both rear tires may not be pulling with maximum tractive force or even equally: Therefore the subject of this Technical Topic is a simple analysis of the forces and torques acting on the rear suspension and how to compensate for the various unequal forces on a leaf-spring Pontiac such as a Firebird or Ventura II. 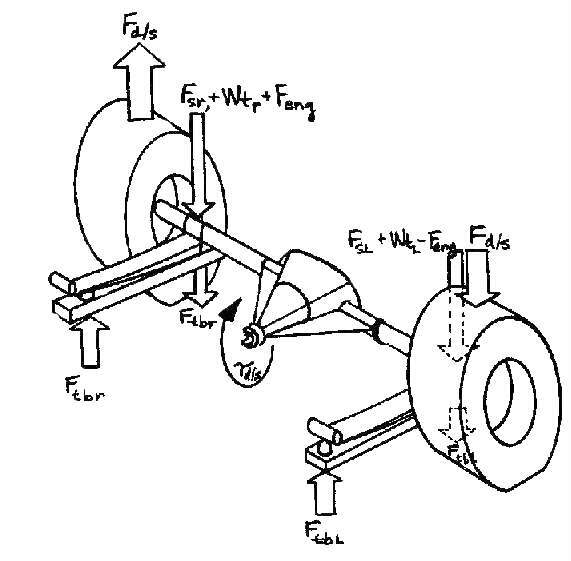 Below is a sketch of a typical leaf-spring suspension with traction bars. The forces acting on each rear wheel and the "upsetting" force due to the driveshaft torque are illustrated. The ideal situation is when the forces on both wheels are equal. To figure out how to get this ideal situations we have to know the contribution of each of the terms in the above formulas and adjust them accordingly. Let us look at an example and see how unevenly the tires are loaded in a typical situation. A 1973 Firebird Trans Am 455 Super Duty weighs about 3640. About 45% of the static weight is on the rear wheels so the force due to the rear springs (equal spring rates in this case) is 819 lb on each side. An average driver weight is 180 lb. About 60% of his weight is on the driver side and about 45% of that weight is on the rear wheels, so the uneven weight is 45 lb on the left side, 32 lb on the right side. A typical 455 SD engine torque value is 400 ft-lb. We see that without traction bars we are unevenly loaded by 369 lbs: If we are clever in our traction bar and tire adjustment, we can compensate for most of this. Referring back to the description of the force due to the traction bar, we note that both the coefficient of tire friction and the traction bar snubber distance are adjustable. Most traction bars such as JR Action Bars have provision for locating the snubber in one of two locations. The longer location (22") is used on the left side and the closer one (20") is used on the right side. If the coefficient of tire friction is 1.0, then the resultant left traction bar force is 1211 lbs (1 .0 x 400 x 2.43 x .5 x 4.56/1.83) and the resultant right traction bar force is 1327 lbs (1.0 x 400 x 2 .43 x .5 x 4.56/1.67) . The net difference is only ll6 lbs, so the Trans Am will still not be equally loaded but should run much quicker mostly because of the added tire loading provided by the traction bars (2538 lb total). The Trans Am will be quicker yet, but still not at maximum potential since the left slick is working at less than maximum traction. This set-up provides the maximum downward force on the tires (4257 lb) and although it is less than the maximum available acceleration force of 5540 lb (400 a 2.43 x 4.56 x 1.25), in actuality, chassis reaction due to the acceleration will provide additional spring force to increase the acceleration force and tend to keep the chassis level in the rear (keep the rear end from jumping up due to traction bar reaction). In any case, now you know how to go about getting that hole-shot on the competition!